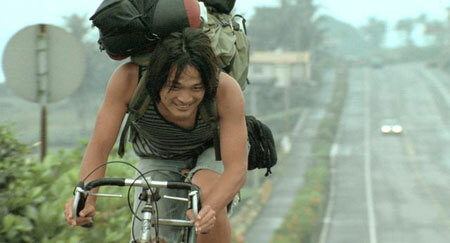 Tung Ming-Hsiang bikes his heart out in Island Etude. The Skinny: A Taiwanese film that effectively shows the beauty of Taiwan, Taiwan's official entry to the Academy Awards is definitely more worthy than its "substitute" status. When looking back to the summer of 2007, Island Etude may be remembered as the directorial debut of famed cinematographer En Chen (who worked on Taiwanese director Hou Hsiao-Hsien's classics City of Sadness and Good Men, Good Women), or as the highest-grossing Taiwanese film of the year. However, Ang Lee's Lust, Caution then came along and changed everything; not only did the espionage drama take over as Taiwan's highest-grossing Chinese film of the year, it got rejected by the Academy Awards for "not being Taiwanese enough", leaving Island Etude to become Taiwan's official entry to the 2008 Oscars. Despite its "substitute status", Island Etude is actually the perfect choice to represent the island nation: it's a beautifully-shot homage to the island's people, its sights, and the sport of bicycle riding that is thankfully free of any political views or pretentious art-house technique. First-time actor Tung Ming-Hsiang plays Ming, a young college student whose lifelong hearing problem causes him to communicate via slurred speech. Carrying a guitar on his back and lacking few concrete reasons, he decides to bike around the island of Taiwan by himself months before his college graduation. Along the way, he enjoys the kindness of strangers, such as a music video crew, a temperamental young man whose parents are going through a divorce, a bus driver who often drives old factory workers to continue their long years of protests, and even a fellow biker who's doing the same trip in a different direction. On the other hand, sometimes he is able to help others, like a Lithuanian model looking for a train and a group of graffiti artists. Like the film's Chinese title - translated as "Practice Song" - suggests, during his journey, Ming gradually learns more about the multi-faceted societies of Taiwan while also learning a little bit more about himself. Being a cinematographer, Chen delivers a striking vision of Taiwan that is a highlight of Island Etude. The screenwriter/director/cinematographer has said that the idea for the film came from when he was making a promotional video for the country's tourist board, during which he met a young man doing the island bike trip. That would explain why the film sometimes does play like an extended promotional video for tourism. However, what is surprising about Island Etude is how well-paced it is. Without any artistic pretensions, the film simply moves from one episode to another, engaging audiences with the diversity of the people Ming encounters. These people cover many of Taiwan's different facets, such as the disintegrating nuclear family, superstitions, scorned workers, and of course, the arts. Blurring the line between fictional narrative and documentary, Chen simply portrays them with no opinions about their current state as if saying, "This is Taiwan. Love it for what it is". While most films of a similar formula would push for some type of dramatic momentum to drive Ming's journey, a key to Island Etude's success is its simplicity. Ming never gives any real reason for his trip other than that he would never be able to do it if he doesn't seize the chance now, and he simply leaves it at that. While it's no surprise that Ming will finish his journey, the end of the journey still doesn't give any real reason or any substantial material reward for finishing it other than internal satisfaction. As much as it sounds like a cliché, the audience is left to focus on the journey rather than the destination, making the film's ability to engage audiences is all the more surprising.